Somewhere in Namibia a mother cheetah is hungry. In order to hunt and provide for herself and her family she will face many challenges. Cubs are easy prey for lions and hyenas. For safety, she will keep herself at least 100 metres away from lions at all times. She locks onto a herd of duiker and separates one injured one from the herd and takes it down. Because lions will steal dinners from cheetahs, her former strategy was to gorge up quickly. Now that she has cubs, she lets them eat first while she keeps a lookout. Before long she spots a lion and has to abandon the meal so she can usher her cubs off to a safe distance. 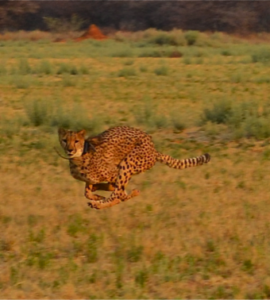 Fierce competition among predators within wildlife reserves can force cheetahs to roam outside these protected areas where they encounter another dangerous animal – humans. In Namibia, she will have to avoid the temptation to feed on livestock or she may be shot. 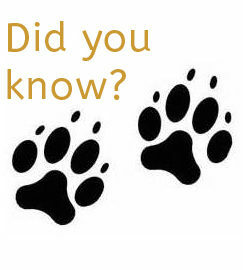 For cheetahs living in other areas of Africa, the illegal pet trade makes cheetah cubs especially vulnerable. 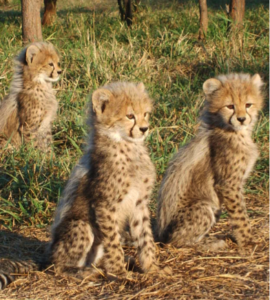 Centered in the Horn of Africa, the poaching and trafficking of cheetah cubs is decimating cheetah populations and negatively impacting the ecosystems in which they live. 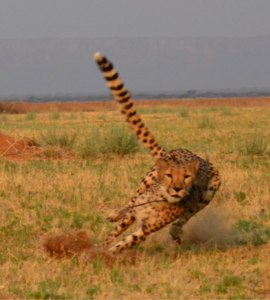 Since 2005, Cheetah Conservation Fund (CCF) has been working with partners and authorities in Somaliland to prevent poaching and trafficking of cheetahs. Over the past seven years, CCF has rescued or helped confiscate 52 cheetahs in Somaliland. 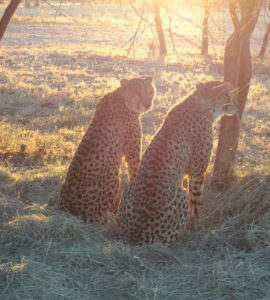 Human activity threatens the survival of cheetahs in the wild, whether it is the illegal pet trade, human-wildlife conflict, climate change or habitat loss. CCF is creating incentives to stop humans from engaging in activities that threaten the existence of cheetahs and instead turn them into guardians of cheetahs, their habitat and the planet we share. As the still hungry mother cheetah and her cubs continue their quest they come to a farm with many goats. Two large Anatolian shepherd dogs bark and sound menacing, causing mother cheetah and her cubs to move on. She has again failed to secure food, but at least she hasn’t been shot or captured. Fewer cheetahs are getting shot by farmers these days thanks to CCF’s farmer education and the livestock guarding dog program which has shown farmers an 80-100% reduction in livestock losses. 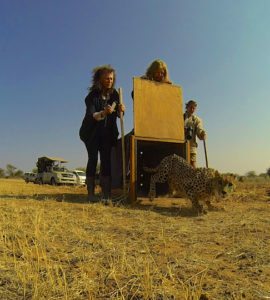 When human-wildlife conflicts result in orphaned or captured cheetahs, CCF looks after them and chooses suitable locations to release them back into the wild. 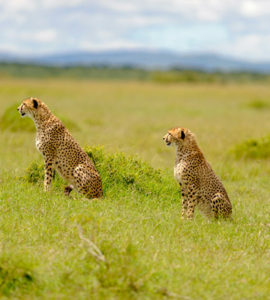 The mother cheetah’s streamlined body is designed for speed which means she can catch prey that lions can’t easily catch. Farming and climate change caused by human activity have changed the vegetation so that thornbush grows out of control. When mother cheetah spots impala, that pesky thornbush stops her from getting up to full speed and she has another failed hunt. Thankfully CCF is helping to return the vegetations to a semi-open or open savannah style that works best for her hunting style. Their Bushblok program creates an economic incentive to remove thornbush and convert it into a sustainable fuel source for cooking. Finally, after much roaming, mother cheetah catches a meal for her family. Of course she doesn’t think about her role in keeping herbivore populations in check so they don’t eat too much vegetation, nor does she realize that she is helping to combat climate change by reducing the amount of carbon dioxide being released into the atmosphere. Humans are beginning to understand the value of large carnivores to the health of ecosystems. We are learning from mistakes in the past and finding that the impact of carnivores trickles all the way down to the soil. 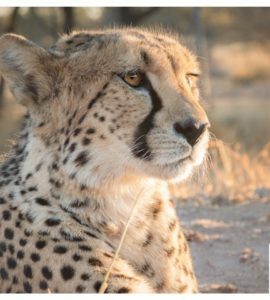 Through research, education, conservation and the rescue and return of injured and orphaned cheetahs to the wild, CCF is a guardian of the cheetah and planet earth too.